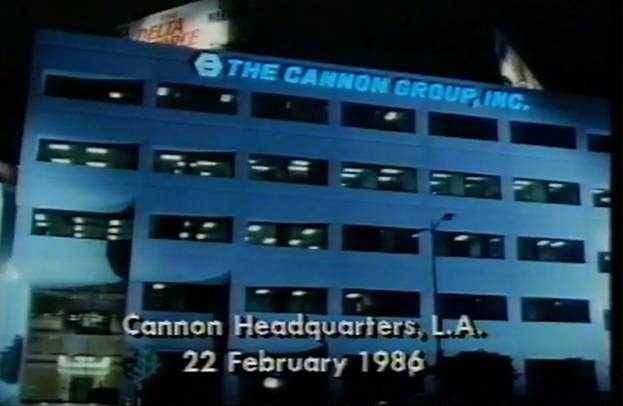 On the triumphant night of February 22, 1986, Cannon Headquarters grand opening party was held in Los Angeles. If you were an important element of these city streets, you couldn’t afford to miss this night. In attendance that night was everyone from Michael Dudikoff, who could be seen sporting a full denim-on-denim wardrobe and sitting in a luxiourious sofa, emmursed in cigarette smoke, to dame Vanity, who halfway through the night drifted into a corporate office with her date, a bag of narcotics. Outside by the rooftop pool was Sly Stallone, conversing with Brigitte Neilsen about the global franchise that would be the Cobra film series. Too bad for Sly and the rest of us, Cobra only made it to one picture. Trying to comprehend the amount of power and sheer explosiveness of what else went on behind these doors is something I for one, cannot do. So we’ll let the music do the talking. The following theme has been chosen because it is the only track worthy of contemplating The Cannon Group. This is the entrance music upon walking into Cannon Headquarters. Each time you set foot on the grounds of this legendary corporate lair, this is the song that plays in the background. While streaming the track, take a long, hard glimpse at the above photo of Cannon’s fortress. You, your hot sister and even I…are just not worthy. also, fitting to this post….if you look closely at the picture, on the roof of Cannon's fortress you'll see a billboard for 1986's 'The Delta Force'. the cannon logo is like a proof of quality, menahem and yoram always delivered! next step after re-opening tech noir should be a CANNON GROUP relaunch! The Silvestri Delta Force Theme, an inspirational anthem if there ever was one….